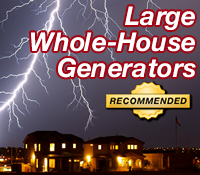 Electric Generators Direct Lists Best Large Whole House Generators. Recommendations Based on Sales History and Expert Reviews. If your plan to weather a power outage is to thrive instead of just survive, these large whole-house generators are perfect for you. With summer storm season in full swing, Electric Generators Direct announced its recommendations for the best large whole-house standby generators. "These whole-house standby generators are big enough to restore power to your entire circuit board," said Jim Baugher, resident product expert at Electric Generators Direct. "If your plan to weather a power outage is to thrive instead of just survive, these large whole-house generators are perfect for you." According to Baugher, most retailers are loyal to whatever standby generators are on their shelves. ElectricGeneratorsDirect.com, however, isn't your ordinary retailer. The online superstore specializes exclusively in electric generators and carries more than 350 models from the leading national brands. Once the dust and data settled, only 3 large whole-house standby generators sold by Electric Generators Direct were given its prestigious "Recommended" status. In addition, Baugher personally wrote online reviews for each whole-house standby generator, explaining why the company recommended it. By providing the recommendations and reviews, ElectricGeneratorsDirect.com hopes to arm shoppers with enough ammunition to pick the perfect whole-house standby generator to keep them safe and protected during storms and ensuing power losses. Power Equipment Direct operates 11 niche online superstores. In addition to ElectricGeneratorsDirect.com, the Bolingbrook, IL-based company operates AirCompressorsDirect.com, ChainSawsDirect.com, LeafBlowersDirect.com, LogSplittersDirect.com, MowersDirect.com, PressureWashersDirect.com, SnowBlowersDirect.com, SumpPumpsDirect.com, TillersDirect.com and WaterPumpsDirect.com.